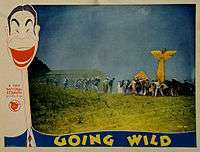 Going Wild is a 1930 Warner Brothers Pre-Code comedy film, based on the 1910 play The Aviator by James Montgomery, and directed by William A. Seiter. The film stars a bevy of musical stars in addition to the three comic stars, Joe E. Brown, Frank McHugh and Johnny Arthur. The flying sequences are the highlight of the film. Rollo Smith (Joe E. Brown) and his friend Jack Lane (Lawrence Gray) are down on their luck and have stowed away on a train, finding a place in the compartment of ace pilot and writer Robert Story (Arthur Hoyt). The conductor (Fred Kelsey) tosses the pair off the train just where the famous writer is supposed to arrive, with Rollo being mistaken for Story. Peggy Freeman (Laura Lee) and May Bunch (May Boley) both vie for Rollo's attention, believing that he is a famous pilot. The two freeloaders get free room and meals at the Palm Inn and everything is going well until Story is invited to fly in an air race, facing a real aviator, "Ace" Benton (Walter Pidgeon), and a chance to win a $25,000 wager. The only problem is that Rollo has never even been in an aircraft. With the girls betting on him, and Peggy disguised as his mechanic and smuggling aboard an aircraft, he somehow makes it into the air, but then everything becomes harried as he can barely control the aircraft. Ferguson (Max Wagner), the real pilot who Peggy had locked in a closet, shows up, but Rollo continues to put on an aerial show, forcing Ace to abandon the race. When Peggy accidentally pulls her parachute ring, Rollo joins her as they safely float to earth and he proposes. The last 10 minutes of Going Wild showcased an impromptu aerial duel. Going Wild was filmed in Glendale, California at the Griffith Park Aerodrome (near Hollywood), using the California National Guard hangars with additional scenes shot at the Warner Brothers Burbank Studios. A Travel Air B-4000 (c/n 1323, NC688K) appearing as the "Blue Star" is the same aircraft that appears in films the Tailspin Tommy series (1934) and Wings in the Dark (1935). The character Ace Barton flies a Travel Air 9000/4000 (c/n 381, NC4421), named "The Zoom", later appearing in Skyway (1933). Originally intended as a musical, with Lawrence Gray, Ona Munson, Walter Pidgeon, Laura Lee and May Boley, all musical stars, who were given contracts by Warner Bros. for their musical talents. Despite all the musical talent in the film, only one song, "My Hero Mine" appeared (sung by Joe E. Brown and Laura Lee), and a few musical numbers that were more background than featured songs. The press sheet for the film did not even mention this song. Johnny Arthur plays a gay character. As the fake Robert Story, Joe E. Brown in signing autographs on the book, Whatever Goes Up! for a group of adoring women, he also adds his room number. When Lawrence Gray tells Joe E. Brown about his new girlfriend, Brown declares "I love you too. I'm mad about you. Kiss me" while he puckers up for Gray. Although the hotel is full, an attractive woman asks the hotel manager (Frank McHugh) that she desperately needs a room and he tells the front boy to set up a cot in his office and winks at her. Going Wild survives only in the cut version which was released in late 1930 by Warner Brothers. The complete film was released intact in countries outside the United States. It is unknown whether a copy of this full version still exists. This version is also on DVD through the Warner Archive Collection. One foreign language version of the 1930 version of Going Wild was made. The French version was titled L'aviateur and was released in 1931. Mourdant Hall in his review for The New York Times, reflected on the critical and audience reaction to Going Wild. "It is a farce that depends more upon actions than words, and it was no wonder that the spectators at an early showing of this film actually shrieked with laughter and really rocked in their seats. ... It is an ingenious affair which is not particularly novel, but the manner in which it is worked out is decidedly clever." Critics loved the antics of Joe E. Brown. "... And about that face: critics averred that the scene in which Brown opens his famously cavernous mouth when a doctor tells him to say 'aaaah' was 'worth the price of admission all by itself'." Aviation film historian Stephen Pendo noted Going Wild had a similar theme to The Aviator (1929). ↑ Due to the backlash against musicals, all of the musical talent in Going Wild were released from their Warner Bros. contracts by 1931. ↑ Wynne 1987, p. 173. ↑ Santoir, Christian. "Going Wild". aeromovies.fr. Retrieved: November 26, 2014. 1 2 Barrios 1995, p. 330. ↑ "Notes: Going Wild." Turner Classic Movies. Retrieved: November 26, 2014. ↑ Hall, Mourdant. "Movie review." The New York Times, January 26, 1931. ↑ LeVoit, Violet. "Articles: Going Wild." Turner Classic Movies. Retrieved: November 26, 2014. ↑ Pendo 1985, p. 36. Barrios, Richard. A Song in the Dark: The Birth of the Musical Film. New York: Oxford University Press, 1995. ISBN 978-0-19508-811-3. Wynne, H. Hugh. The Motion Picture Stunt Pilots and Hollywood's Classic Aviation Movies. Missoula, Montana: Pictorial Histories Publishing Co., 1987. ISBN 0-933126-85-9.